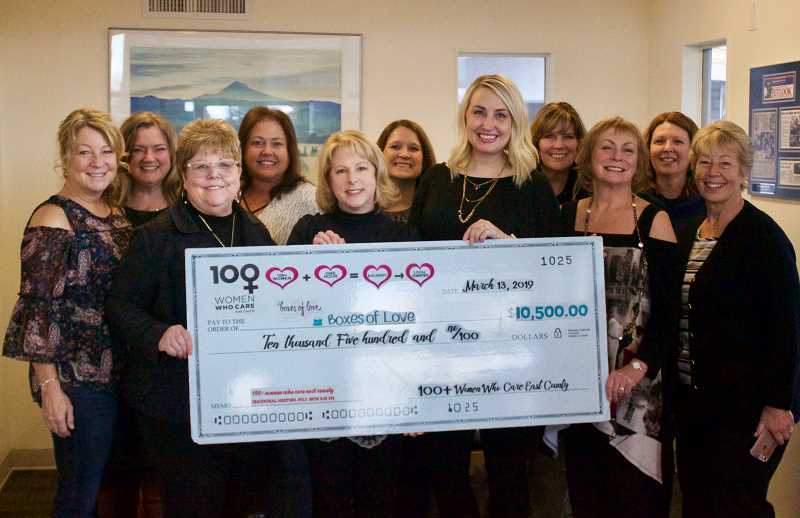 A group of motivated women presented a check for more than $10,000 Wednesday afternoon, March 13, to a nonprofit organization dedicated to supporting children in foster care. Several members of 100+ Women Who Care East County came together at Gresham Ford, 1999 Powell Blvd., to give $10,500 to Gresham-based Boxes of Love, which partners with local children's hospitals to provide kids entering the foster care system with a box filled with clothing and other basic essentials. The combined donation allows the members of 100+ Women Who Care to make a real impact within the community, without putting on a time-consuming fundraising event. The next meeting will be Thursday, April 25, at Migration Brewing, 18188 N.E. Wilkes Road. A time has not yet been determined. To learn more about Boxes of Love, visit www.boxesofloveproject.org/about/.